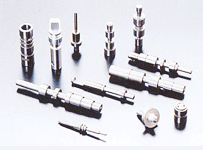 High-precision spool valves are manufactured in an integrated manner based on the precision machining technology from the molding stage, surface treatment, and to the polishing stage. Steel and aluminum valves are available. The high-reliability wire cabling system is adopted for harness modules to allow easy connection even in sophisticated wiring. In addition, an appropriate cabling layout has been realized by developing harness modules as part of a system containing control valves. Nidec Tosok provides key parts that support automotive progress.